Classic round of the Lawers Munros, walkable in a day. My original route was to drop down into Glen Lyon (drop N from Meall Greig, follow tracks along S bank of R. Lyon and pick up access track up Glean Da Eig back towards start). Instead, I opted for the longer (but less climbing) option so that I could maintain mobile-phone reception as it was getting late and there were storms brewing! The weather was perfect for the drive up, but forecast to deteriorate. I decided to head to the Lawers area and try and get some desperately last-minute "UTMB" training in (hence hills rather than glens). This year hadn't gone great running wise for reasons mentioned, so when I do get out I am all the more appreciative of having health, fitness and such fantastic countryside on the doorstep. After a bit of Lake-District-style parking somewhere around the tiny car park beneath the cairn (594416), I was jogging up a well-engineered track NE, the sun beaming down, the sky full of fluffy clouds, for now anyway. It was already after 2pm so the majority of folks were coming the other way, having already earned their pints or whatever. The path stops at bog, but it is a downhill bog so that's okay, I was aiming for the burn (Allt Geann Da' Eig) and then drier, steeper grassy hillside beyond it. 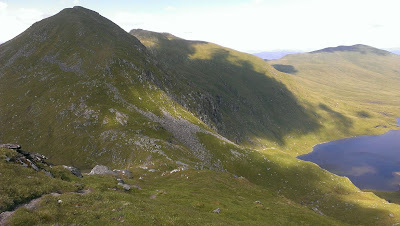 A feint path emerges beyond the burn and ascends around the corner of Coire Gorm, crossing its smaller burn (water bottle refill already!) 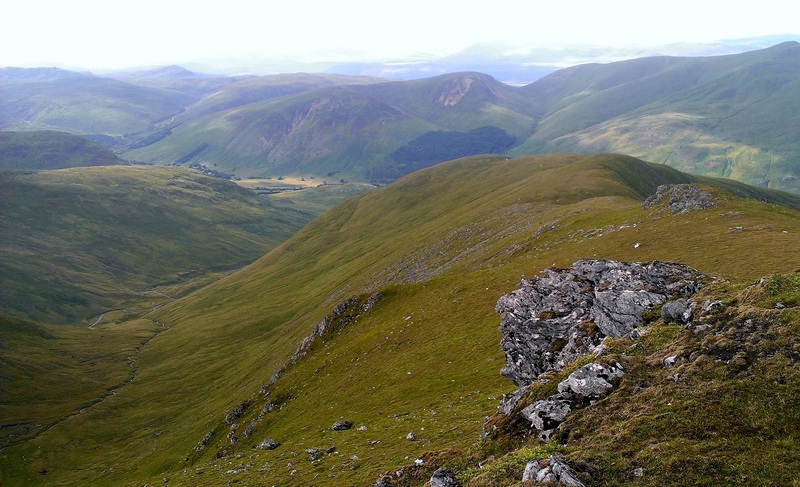 before taking an uncompromising line up the steepening side of Meall a Choire Leith. I stupidly tried to run all the way from car to summit (not clever UTMB training), so when I got to the top I was burst, but buzzing on endorphins and really happy to be up in the hills again. From then on the gradients are much easier so the running was great! In particular there's a nice path over to summit No. 2 of the day, Meall Corranaich, with fine views of the next summits on the list, and also far-reaching views to the N horizon, Ben Nevis particularly prominent. About 100 or more deer ran in front of me as I ascended! (Worth pointing out that the path passes by another fine spring for filling the water bottles). The next bit was steeper, a sharp drop down beneath Beinn Ghlas - as you descend to the bealach ignore the gently-ascending "good" track that crosses between the mountains and look for the much fainter, steeper trail continuing up onto the NW ridge of the Beinn - it keeps South of the rockier bits and curves onto its crest via a grassy slope. I of course missed this and ended up crawling up from the NW on all-fours. 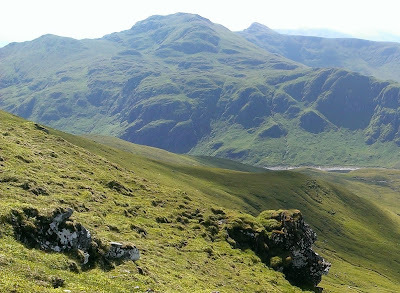 Once on top of Beinn Ghlas I was almost grateful to join the motorway up to Ben Lawers - another great trail run. 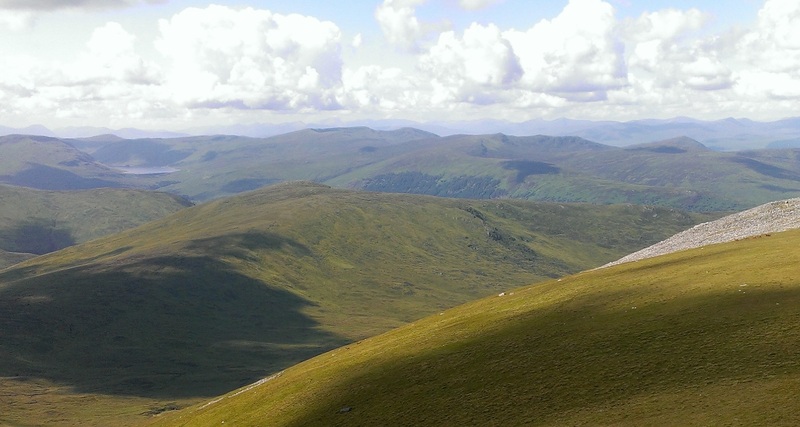 The ridge swings N immediately from the summit of Lawers, and suddenly things look a bit wilder. Less people. More rocks. But a perfectly good and less ugly track descends down the ridge, steepening as it approaches the base of An Stuc (descend the bealach slightly N to get another stream for filling the bottles). The ascent up An Stuc is initially steep but it levels off again towards the top. A fine place to be. Now I've never been particularly confident with heights, but I seem to be getting softer with age. I don't get any thrill out of being in exposed places, quite the opposite, so when I started the descent off An Stuc's E ridge and found myself above wet, slightly mossy slab of rock with a 30ft drop if I screwed up, I was actually pleased with myself for accepting my limitations and turning around. Maybe okay for ascending but not descending, certainly not by me anyway! Especially since vertigo is listed as a possible side-effect of the medication I've been put on! When I got back to the top I spotted that I'd come off the main path (which swings to the S and takes a much easier line). This I was much happier on, it wasn't so much a scramble as a bloody steep path requiring lots of care (and testing loose rocks before putting weight on them). I personally wouldn't go near here in Winter. The rain had started briefly, I knew it was coming, but I could still see most of Northern Scotland basking in sunshine. The South was getting a soaking. 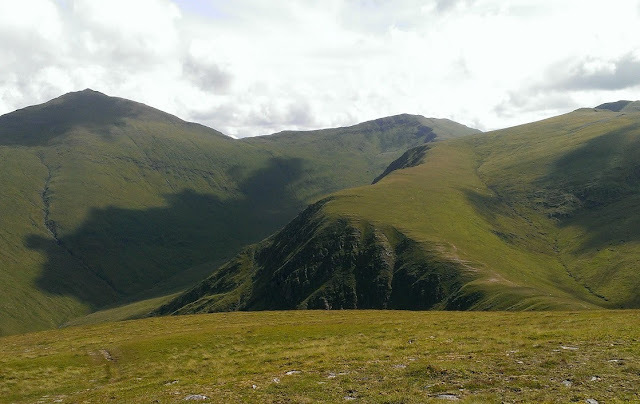 I continued over to the summit of Meall Garbh (a great view back over An Stuc and the Ben), steep in places, but from there to Meall Greig the mountainous feel evaporates into rolling grassy country-side, perhaps a bit of a drag to walk but it was a great place for a run! A note left on the summit cairn brought a tear to my eye (definitely getting softer with age). 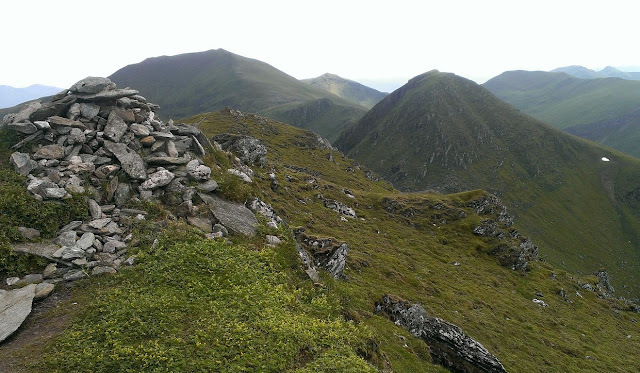 So that was that, seven Munros unceremoniously bagged (including one I hadn't done before - An Stuc weren't on the list when I were a lad!). As the sky started creating its own set of mountains in the form of storm clouds, and as it was quite late in the day, I decided against my original plan of dropping N into Glen Lyon. 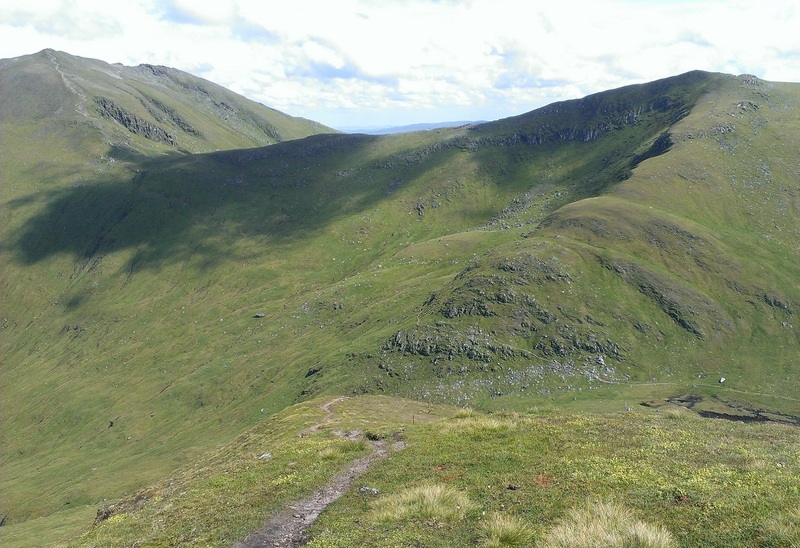 A slight regret - it looks like a nice route (Glen Lyon is beautiful), and is actually shorter than what I ended up doing, although a bit more re-ascent required to get back to the car! 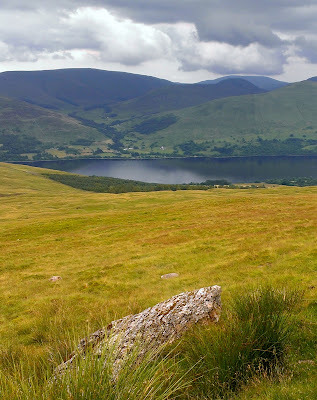 Because today had been a bit spontaneous, I hadn't really read up on the route through Glen Lyon (I'd planned this circuit a year or so ago and forgotten the details), and knew I wouldn't have phone signal down there, so stuck to the S aspect of the range instead. After almost three miles of heavenly running, its important (I think) to take the feint upper-fork in the track, which ends abruptly above a defile. I followed the fence-line on its far side, but there's no path and the terrain is quite rough going. 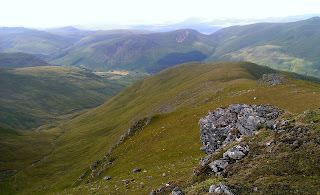 I was wary of losing too much height here, and aimed to remain above the lump marked on the map as Creag Dubh, which meant climbing slightly, and I was reduced to power-walking. Once over Creag Dubh the contours turn more NW (into Corrie a' Chonnaidh), and I was finding traces of sheep-trod along the fence line here. Eventually I was looking over the fenced-off deciduous plantation about 70m vertically below, and ignored the direct line down (involving climbing a deer fence and feeling naughty!) and continued to contour more N to pick up the main path down off Beinn Ghlas, which is all very civilised and uses a gate! 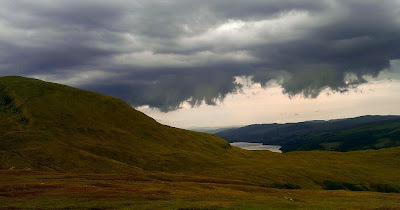 I was being soaked by thick drizzle by now, but grateful to be off the ridges and not exposed to thunder/hail storms - there'd been many of these lately. From the N.T.S. car park it was a 3 mile uphill road-run back to the car sitting on its own at 8pm.